Time and time again we see evidence of a racist agenda in elements of the press. Relentless discriminatory language aimed at minority groups is having a hugely damaging effect on society – fuelling prejudice, increasing intolerance, inflaming tensions between communities, and ultimately leading to more violence on our streets. According to data from the Home Office, hate crime has surged across the country with those directed at people because of their religious beliefs doubling since 2015. Most recently, racism in the press has been called out by high-profile figures such as footballers Raheem Sterling and Romelu Lukaku, and our open letter to the press industry’s so-called ‘regulator’ has been supported by more than 100 co-signatories including Jamelia, John Barnes MBE and Baroness Warsi. Currently, the sham ‘regulator’ IPSO cannot take complaints about discriminatory language aimed at groups, only individuals, making them complicit in the hate directed at minority communities. As stated in our open letter, the issue needs to be tackled publicly and urgently NOW. We have covered their faces, although the Mail Online did not. Last week we saw more evidence of racism in the press. 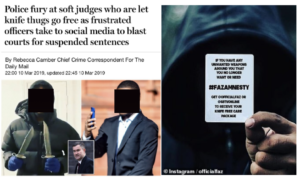 The Daily Mail used an image of anti-knife crime campaigner Faron Paul in an article which appeared to portray him as a “knife thug” with the headline “Police fury at soft judges who let knife thugs go free as frustrated officers take to social media to blast courts for suspended sentences”. Mr Paul’s successful social media ‘Faz Amnesty’ campaign involves incentivising teenagers to hand in their knives in exchange for clothing vouchers. He then gives the knives handed in over to the police. The vocational work of Faron Paul and his one-man knife amnesty operation was known to the Daily Mail, who had asked his permission to use ‘screen grabs’ from his Instagram video. The picture in question features Paul holding two large weapons that he had recovered, taken from a still shot on one of his instagram videos. The same video features a comment from the Mail Online requesting permission to use footage on their website, which was then used as click-bait implying he was one of the “knife thugs” described in the article by the Chief Crime Correspondent, Rebecca Camber. Presumably, Mr Paul’s image was misused purely because he fit the Mail’s profile for what a perpetrator of knife crime should look like. Even if this was not done intentionally, basic due diligence would have shown the origin of the image and the context behind it. Will the toothless complaints-handler IPSO be looking into this? Doubtful. This case also echoes that of the highly prominent media distortion in the case of Mark Duggan, who’s controversial killing sparked riots across London. 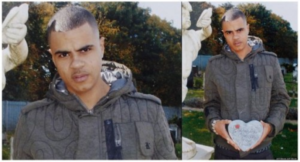 The iconic image of Mark Duggan with a set, unsmiling expression was widely used to accompany articles about his supposed gangster background. The famous image portraying a hard faced gangster actually shows Mark’s expression of grief, due to the fact it’s cropped from a larger image of him holding a tribute at his daughter’s graveside. 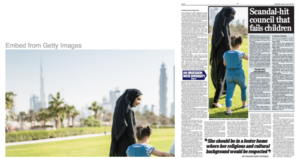 In August 2017, the Daily Mail newspaper doctored a stock image so a woman appeared to be in a face-covering niqab, not a hijab, in order to illustrate a controversial story, later shown to be riddled with inaccuracies, about a Muslim family fostering a child. What does it say about elements of the press, that it sees the doctored image as more provocative and marketable than the original of the hijab? We have blurred out Professor Tulloch’s face, although the original did not. And media distortion is not exclusive to the Daily Mail. Photographs are often used in the media to misrepresent stories and to sway an agenda. 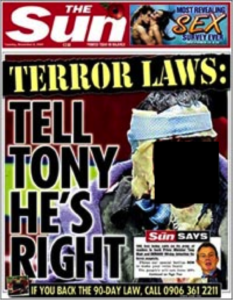 After the 7/7 bombings, The Sun newspaper used a close-up picture of survivor Professor John Tulloch’s bloodied face with the headline “Terror laws: Tell Tony he’s right”, after the Government defeat over Tony Blair’s terror bill in November 2005. Professor Tulloch’s image was used without his consent to show support for Tony Blair’s policy. But not only did Tulloch not consent, but he disagreed with the line The Sun took on the legislation. Yet that line was published alongside his face, as if it was him saying it. As a professor in media studies, Professor Tulloch fought back with his book ‘Terror, Risk and War’, where he examines how images are chosen by the press and how they are used. By working in the past with victims of press abuse, we know that images can even be lifted from your public social media platforms without your consent. 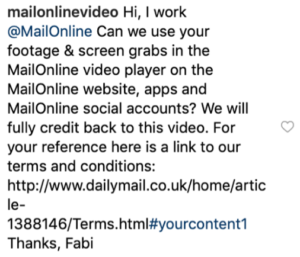 Moreover, it appears from the Mail’s terms published here that any of your content which you do give permission for the Daily Mail to use can then continue to be published – even if you change your mind. This would mean that your image for one article could then be reused for any story that the Daily Mail deem it relevant going forward – even if there is no relevance. Whilst Clause 1 (Accuracy) of IPSO’s code prohibits the publication of inaccurate, misleading or distorted material which includes pictures, IPSO’s code is inadequate and does not actually address specifically address how an image is obtained, or the owner’s rights.